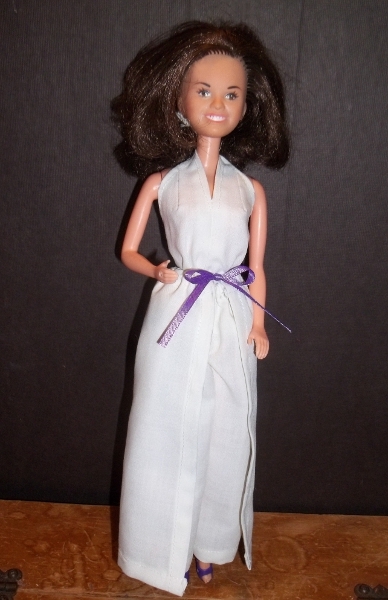 This isn’t my beloved childhood Marie Osmond Doll. If it was, you’d know by the cropped hair and blacked-out teeth. I didn’t set out to deface her; I just wasn’t quite old enough to understand that a doll can’t brush her teeth and let her hair grow out after Halloween like a real girl can. So, she endured years of hats, headscarves, elaborate combovers, and occasional Wite-Out dental treatments before being lost in one move or another. She was the only doll I, or anyone else I knew, had with dark hair and pale skin like mine, and I loved her for it. Actually a fair likeness of Marie.